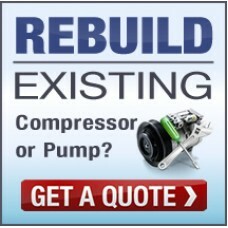 Normally we can supply a new compressor for every car, at a much cheaper price than rebuilding your existing one, however, if you cannot find the compressor for your car then we can rebuild the unit you have. Click the 'Add to Cart' button below, and complete the payment procedure. Make sure you add in the notes when paying, when you want us to collect the unit and what vehicle the car is off. We will collect your old unit, so you must remove it from the car first and put it into a box, and seal it. Send it back to you with 12 months warranty. The rebuilt unit will include the pulley and clutch mechanism. The whole process normally takes around 1-5 working days from collection to delivering it back to you. Please note: Compressor 12 month warranty subject to new receiver drier and expansion valve to be fitted, and full system flush before regassing. Failure to do so may invalidate warranty.